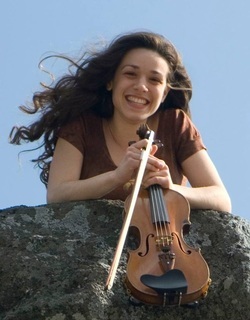 Amberly Rosen is known for her eclectic musical repertoire, contagious smile, and never ending enthusiasm, violinist Amberly Rosen has been playing violin since the age of three and performing since she was six. She has studied and performed many styles of music including classical, old time fiddle, bluegrass, Celtic, as well as traditional folk dance music from countries in the Balkans, Scandinavian, Mediterranean, and Trans-Carpathian styles. Her energy and desire to share these musical traditions with audiences has taken her across the country and beyond, to Greece, Bulgaria, and Japan. Amberly has performed as a guest with Ivan Paskalev in Plovdiv, Bulgaria, in the groups Phat Strad and New Country Strings in Las Vegas, NV, in the groups Sonic Roots, and Never Second Fiddle in Hershey, PA, and as one half of The Rosen Sisters; with her sister, Ariana. BELOW -- From Maddie & Tae on Letterman, September 13, 2014.